Experts disagree on whether the weather pattern has formed, but federal scientists may weigh in with a verdict next week. 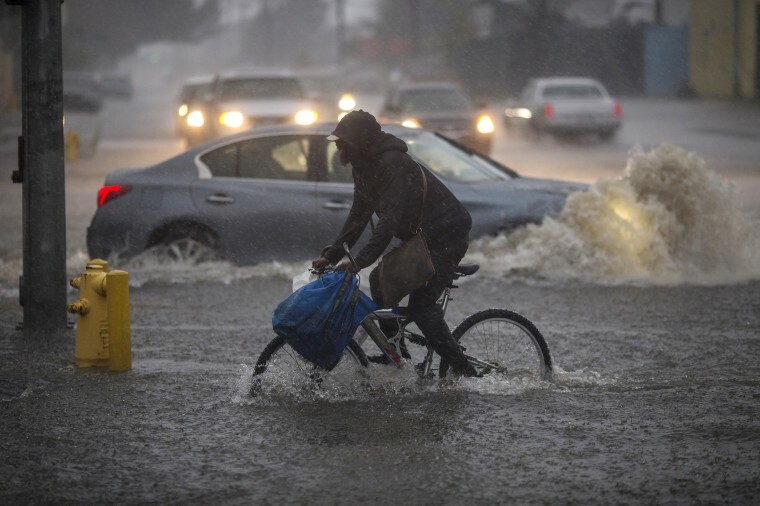 LOS ANGELES — Southern California was in the midst of its fourth rain event of the season this week and with another expected next week, some experts believe the arrival of the weather phenomenon known as El Niño could be imminent. While it may be too early to link the Pacific storms to El Niño, the federal Climate Prediction Center's El Niño "diagnostics discussion" could make the call next week on Dec. 13. If a full-on El Niño weather pattern is forming, it would mean an increased chance of more rain in California and a possible end to a moderate drought that has fueled wildfires throughout the state. The linchpin of El Niño, consistently above-average warmth in the waters of the equatorial Pacific, is already present, scientists say. Federal forecasters are waiting for those waters to interact with the atmosphere and create storms before they declare El Niño's presence. "The temps are quite warm on the surface, but we’re just waiting for the atmospheric component to give us some storminess," said Andrea Bair, climate services program manager for the Western region of the National Weather Service. California state climatologist Mike Anderson says the storms that have struck California since late November resemble classic El Niño systems, which often soak up tropical moisture from the central Pacific before blasting the Golden State coast like a fire hose. "Some of that includes the way the jet stream behaves," he said. "It tends to zip across the Pacific in an east-west pattern. It’s also accelerated, and we see storms hit fairly quickly. We’re starting to see some of that take shape." Other experts say it's too early in the season to attribute the storms to the weather pattern named for baby Jesus because its telltale warm waters often peak around Christmas. The system's rising air motion has been known to lead to above-average rainfall in the eastern Pacific Ocean. It can also impact global weather patterns. In Australia, the phenomenon can mean less rain. "El Niño has not formed yet," said Jan Null, a former National Weather Service lead forecaster who is an expert on the phenomenon and believes it's too early to make the call. "It's still in the formative stages. [Determining] whether it's having an effect on our weather now is problematic." And Bair, of the weather service's Western region, said Southern California's recent storm activity "does look like what we'd expect during an El Niño." But she cautioned, "You can get those in any given year." Climate researchers say unusually warm waters off Southern California, where records were set in the summer and sea surface temperatures remain unusually high for the time of year, could boost the moisture for any systems that hit the coast. This isn't necessarily tied to El Niño. "Warmer coastal sea surface temperatures should enhance precipitation from some storms," said Alexander Gershunov, research meteorologist at the Scripps Institution of Oceanography. Even if some level of El Niño is en route, a consistently wet one for California is far from assured. "We have outcomes during El Niño years that are very wet and very dry," state climatologist Anderson said. Weather experts are betting on the Climate Prediction Center to declare a weak to moderate El Niño. "It is a weak El Niño, but there is some hope for above-normal rainfall," said Jin-Yi Yu, professor of earth system science at the University of California, Irvine. There hasn't been a classically wet El Niño in California this century, he said. In the 1980s and 1990s, El Niño was triggered by unusually warm water along the eastern portion of the equatorial Pacific. That warmth fed a jet stream that aimed for much of California from the Bay Area south. El Niño attacked this way in the historic California storm years 1983 and 1998. But this century's strongest El Niño in 2016 hopped over the estimated 20 million people living in Southern California in favor of a trajectory that aimed north of San Francisco and struck the Pacific Northwest. Yu called this a central Pacific El Niño because the warm waters of the equatorial Pacific remained west instead of migrating toward Central and South America. "We know this new type of El Niño does not bring us the rain that a traditional El Niño from the eastern Pacific brings," he said. "Most of these new El Niños are usually very weak." The rain didn't come in 2016, but the surf did. "We had a number of significant swells" in California, said Kevin Wallis, lead forecaster for wave prediction service Surfline. This year, strangely, south swells continued to hit the Southern California coast deep into November, he said. "The south swell you associate with summer and early fall," Wallis said. Gershunov, of the Scripps Institution of Oceanography in La Jolla, said global warming has upended classic weather patterns, possibly even El Niño. Winters in California are shorter but more intense. Summers, he said, are getting longer and longer. "There’s still a lot of research that needs to be done to understand why the El Niño's signals have not been impacting this region in the last 20 years," he said.